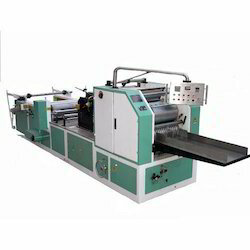 Paper Tissue Paper Making Machine that is available in various shapes and sizes. Our Paper Napkin Machine is manufactured using high quality base materials due to which it is highly efficient and thus renders consistent performance. Apart from the above, we provide Paper Napkin Machine at the most discounted price in the industry. Our Variable Size Paper Napkin Machine is constructed from quality components as base materials that offer a durable structure. Further, the Paper Napkins are soft to feel and very gentle on the skin. Our Napkin Paper are always available with leading outlets in following different sizes within GSM range of 18 Sanitary Napkins. Quality sanitary napkins at affordable will also find a market among rural and lower middle class women who can discard their traditional method of using unhygienic cloth and switch over to these. 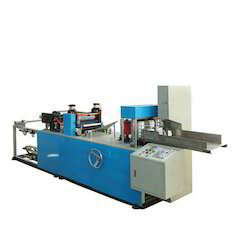 We are an acclaimed name to offer a wide range of quality proven Paper Napkin Machine. Offered product is designed and manufactured using optimum quality materials and highly advanced technology to meet the international quality standards. These products are available with us in various specifications to meet the requirements of various clients. Being a customer oriented organization we always try to timely deliver high quality products to our valued clients at leading market price. 275 to 300 Sheets /Min. Tissue Paper 18 to 27 gsm. Looking for Tissue Paper Making Machine ?